FibatufFibatuf offers high durability, high light transmission and weather resistance. It is ideal for industrian buildings , domestic structures , greenhouses and skylight applications. 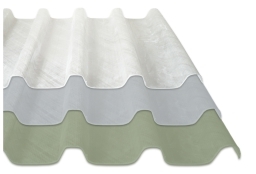 fibatuf is the ideal chocie for Architects and specifiers for noncorrosive industrial structural roofing and siding (cladding), while homeowners prefer fibatuf for a a wide range of DIY projects. Fibatuf is available in a wide variety of colours and profiles. Fibatuf MAX is a heavy duty industrial sheet for extreme conditions or where longevity is required without the concern of strength reduction. 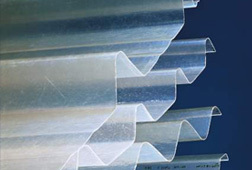 It is a well known fact that thermoplastics like Polycarbonate and PVC become brittle over time, however with the engineered composite of fibatuf MAX , this is no longer a concern.